BigQuery performs best when your data is denormalized. Rather than preserving a relational schema such as a star or snowflake schema, denormalize your data and take advantage of nested and repeated columns. Nested and repeated columns can maintain relationships without the performance impact of preserving a relational (normalized) schema. You can specify nested or nested and repeated data in the UI or a JSON schema file. To specify nested or nested and repeated columns, you use the RECORD (STRUCT) data type. BigQuery supports loading nested and repeated data from source formats that support object-based schemas, such as JSON files, Avro files, Cloud Firestore export files, and Cloud Datastore export files. For example, a relational database used to track library books would likely keep all author information in a separate table. A key such as author_id would be used to link the book to the authors. In BigQuery, you can preserve the relationship between book and author without creating a separate author table. Instead, you create an author column, and you nest fields within it such as the author's first name, last name, date of birth, and so on. If a book has multiple authors, you can make the nested author column repeated. To create a column with nested and repeated data, set the data type of the column to RECORD. A RECORD is stored as a STRUCT and can be accessed as a STRUCT in standard SQL. A STRUCT is a container of ordered fields each with a type (required) and a name (optional). To make the column nested, you add child fields to the RECORD (parent). To make the column repeated, change the mode to REPEATED. When you load nested and repeated data, your schema cannot contain more than 15 levels of nested STRUCTs (RECORD types). BigQuery supports columns of type STRUCT (or RECORD). A STRUCT is a complex type that can be used to represent an object that has multiple child columns. In a STRUCT column, you can also define one or more of the child columns as STRUCT types (referred to as nested or embedded STRUCTs). When you nest STRUCTS, BigQuery enforces a nested depth limit of 15 levels. The nested depth limit is independent of whether the STRUCTs are scalar or array-based. The JSON data file would look like the following. Notice that the addresses column contains an array of values (indicated by [ ]). The multiple addresses in the array are the repeated data. The multiple fields within each address are the nested data. For Source, select Empty table. For Destination, choose your dataset and enter the table name in the Table name field. In the Name field, type addresses. To the right of addresses, click the plus icon to add a nested field. In the Name field, type status. Notice the field is pre-populated with addresses. indicating it's a nested field. For Mode, leave the value set to NULLABLE. Repeat these steps to add address (NULLABLE STRING), city (NULLABLE STRING), state (NULLABLE STRING), zip (NULLABLE STRING), and numberOfYears (NULLABLE STRING). Alternatively, click Edit as text and specify the schema as a JSON array. Click the down arrow icon next to your dataset name in the navigation and click Create new table. The process for loading data is the same as the process for creating an empty table. To the right of RECORD, click the plus icon to add a nested field. After creating your JSON schema file, you can supply it via the command line. After you add a nested column or a nested and repeated column to a table's schema definition, you can modify the column as you would any other type of column. 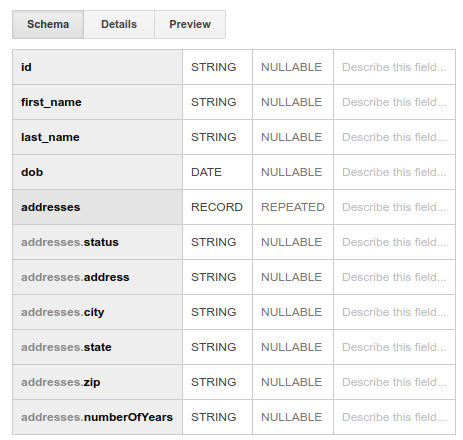 BigQuery natively supports several schema changes such as adding a new nested field to a record or relaxing a nested field's mode. For more information, see Modifying table schemas. Additionally, you can manually modify a schema definition that includes nested and repeated columns. For more information, see Manually changing table schemas.